The last couple of weeks have seemed full of stuff…that is the best way that I can categorize. There has been much that has filled my head and heart. Stuff that has happened around the world…stuff that is in my own neighborhood…stuff in my life and in those close to me. A couple of days ago, I just felt the crushing weight of it all and I must admit that I felt overwhelmed…in fact it made me downright weary. I read this passage this morning and although I am more familiar with the NIV’s rendering that “the peace of God which surpasses all understanding will guard your hearts and minds in Christ Jesus”…the Message gave me a new visual. I have let worry displace Christ. It made me think of Christ on the Throne as my King…my Savior…my Redeemer…my Prince of Peace…firmly in His seat where He belongs. Somehow when my life gets cluttered with stuff…that stuff knocks Jesus off His Throne…His rightful place in my life. Actually He is not just a place in my life…He is my whole life…not just a part. The peace that surpasses all understanding…is just that…it makes no worldly sense how one can feel peace in the midst of being swamped by stuff…but He gives it freely…liberally. I already feel more peace today as I recognized that His seat was occupied. I did a bit of cleaning…by turning those worries into prayers and His Throne is ready to be claimed. 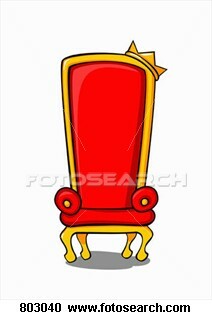 What is His Throne seat looking like to you today? He’s waiting to take a seat…not with a stern face or crossed arms…but with love and outstretched arms…ready to bear the load and every burden…won’t you take Him up on the offer? I know that I am all the better for it. God’s Word is great in any translation! Helen: I love the wording of The Message here….another “settling” down….and a displacement of worry…it is great to be refreshed by scripture by hearing it in different wording…wonderful.